Given Scotlands’ turbulent history and our record of achievement for such a small nation, there are many significant Scottish dates that are worth remembering. Apart from our historical timeline which shaped our destiny, there are many significant dates that have won recognition for Scotland. Considering we are a small country, we have every right to be pleased with our contribution to the world. So here is my list of significant Scottish dates, which includes some of the most notable historical and sporting dates, although it is by no means comprehensive. 597 – The death of St Columba. 1040 – MacBeth murders Duncan and becomes King. 1296 – Edward I of England takes the Stone of Destiny (Coronation Stone) from Scone Palace to Westminster Abbey. 1297 – William Wallace, heavily outnumbered, defeats Edward’s Army at the Battle of Stirling Bridge. 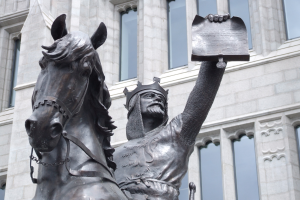 1306 – Robert the Bruce becomes King of Scotland. 1314 – The Battle of Bannockburn sees Robert the Bruce defeating Edward II, which sees Scotland remain independent. 1320 – The Pope accepts the Declaration of Arbroath, recognising Scotland’s independence from England. 1559 – The Reformation in Scotland begins with John Knoxs’ sermon in Perth. 1603 – The Union of the Crowns, with James VI of Scotland becoming James I of England. 1682 – The National Library of Scotland is founded. 1692 – The Glencoe Massacre takes place when the Clan Campbell murder 38 MacDonalds, on the orders of King William and the government. 1707 – Scotland and England are united to form Great Britain, when the Act of Union is passed. 1715 – The first of the Jacobite Rebellions fail with defeat at the Battle of Sheriffmuir. 1744 – The world’s first Golf Club, the Honourable Company of Edinburgh Golfers was founded. 1745 – Bonnie Prince Charlie returns to Scotland to signal the beginning of the second Jacobite Rebellion. 1746 – This Rebellion ends when Bonnie Prince Charlie is defeated by Government troops at the Battle of Culloden. 1860 – Scotland host the first ever Open Golf Championship. 1871 – Scotland and England play the first ever International Rugby Union match. 1872 – Scotland and England play the first ever International Football match. 1873 – The Scottish Football Association was founded. 1890 – The Forth Rail Bridge is opened. 1937 – The Queen Elizabeth, the largest ocean liner ever built, is launched at Clydebank, Scotland. 1943 – German air raids during the Second World War result in the deaths of more than 1000 Scots between Glasgow and Clydebank. 1947 – Walter Donaldson is the first Scotsman to become Snooker World champion. 1964 – The Forth Road Bridge is opened. 1967 – Glasgow Celtic become the first British football team to win the European Cup. 1972 – Glasgow Rangers become the first Scottish team to win the European Cup Winners Cup. 1975 – The first of Scotland’s North Sea oil is piped ashore at Peterhead. 1983 – Aberdeen FC are the second Scottish team to win the European Cup Winners Cup. 1996 – The Stone of Destiny is returned to Edinburgh Castle after 700 years. A replica can be seen at Scone Palace in Perthshire. 1999 – Following devolution through the Scotland Act, 1997, a Scottish Parliament is re-instated after 292 years. 2002 – Stirling is granted city status as part of Queen Elizabeth II’s golden jubilee celebrations. 2012 – Perth is granted city status as part of Queen Elizabeth II’s diamond jubilee celebrations. That completes my list of significant Scottish dates, but let’s not forget there’s a few famous Scots, who contributed to the world in the fields of invention, entertainment, medicine, discovery, sport, and literary accomplishment. They all deserve praise.